FONZ , where u been all my life, i some fonz advice, do i get my hair cut or not? It's ALIVE!!! It's about time you responded LADMO!!! Brick Assassin for Hire Here, have a brick! This comment was edited by Master Lew on Jul 13 2007 07:20am. I added u to MSN for the sheer fun of it! Live fast love hard and dont let anyone else use your comb! This comment was edited by Monteeeeeee on Mar 11 2006 01:06am. This comment was edited by D@RtHM@UL on Feb 27 2006 10:41am. 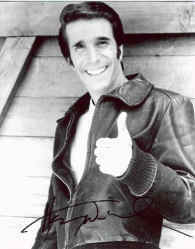 How's it going Fonz? I haven't been here much and just wanted to stop by and say Hey! I also want to wish you a Merry X-mas and a Happy New Year. I hope you're doing well. Till we meet again MTFBWY! This comment was edited by Roan Belouve on Jan 08 2005 02:32am. I just remember I forgot to ask how is going your hockey season ? Too long time no see. How is life treating you ? I hope all is fine for you. well, jobs treating me well. I still gotta do my thesis though, so its kinda cool. well, w/o web, what use are the JK games ? in fact, I game little to nothing, except a small game of starcraft now and then. well lad, this aint gonna happen anywhen soon. my only half-decent link is from work these days, and I dont expect that to change for some time. so, how's the law business ? This comment was edited by Fizz of Belouve on Nov 04 2004 08:06am.